Stay with the truth, sleep well, stay blessed! In any situation, stay with the truth. The manager raises an interesting question. 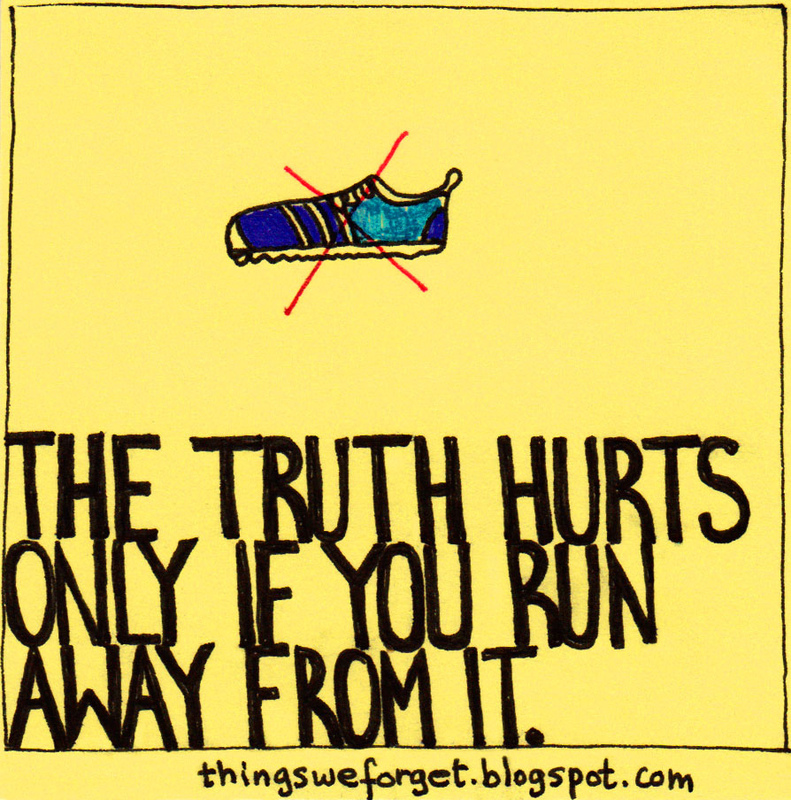 We too have been told, or have sometimes experienced, that staying with the truth can be a competitive disadvantage. Sometimes, we wonder if speaking our mind will make others uncomfortable or even hurt them. We desist from speaking the truth also because we want to cover-up. But let me tell you, from my experience, that truth is a liberator. It is a healer. It is a very deadly weapon, a brahmastra, in our arsenal. I believe we fight shy of using it because we are worried about becoming vulnerable in this ‘big, bad, cold and merciless’ world. Fundamentally, our world view has to change. The world is not made up of hypocrites, cynics, facists, rapists and terrorists alone. They are but a small population from all of humanity. Just like shadows in the dark are amplified by our fears, so are the deeds of a few men and women in the darkness of our minds and hearts. Arise and awaken to the glorious sunshine of the rest of humanity. Making yourself vulnerable by clinging on to the truth, irrespective of the circumstance, alone will fetch you the love, compassion and warmth of like-minded people around you. If someone deserts you because you spoke the truth, then they really were not worth being in your Life. Period. Besides, when you stay with the truth you don’t have to remember what you said! Most importantly, having embraced the truth, you will sleep well. When you can sleep in peace, you are truly blessed. Nothing else, believe me, matters! Author AVIS ViswanathanPosted on July 10, 2015 March 14, 2016 Categories Art of Living, Falsehood, Good Night's Sleep, Happiness, http://schemas.google.com/blogger/2008/kind#post, Inner Peace, Intelligent Living, Lies, TruthLeave a comment on Stay with the truth, sleep well, stay blessed! As long as you know it is the truth, always speak it. Because the truth can and must never be hidden. But the most baffling thing about humankind is that we find it very easy to lie, to cover up, to say what immediately comforts us and the listener, than to speak the truth. Having spoken what’s easy, what came easy, the ideal situation must be to not suffer anymore. Yet, most of time, the person who has chosen not to speak the truth, grieves and suffers. This is what is most tragic. Let’s say you have a tyrant for a boss. And you wish you could tell him what he was doing was wrong. Instead you keep praising him or approving of all his nonsensical behavior because you feel it is easier to pamper him than provide him with constructive feedback. Now, as long as you are living peacefully having deceived yourself and falsely pumped up the boss’ ego, there will really be no problem. But if you continue to feel miserable because you have been saying what you don’t believe in, then you have a problem. The only solution then is to speak the truth about your boss, to him! Contrary to most opinions, the truth is always respected. Both by the one saying it and by the one listening to it. 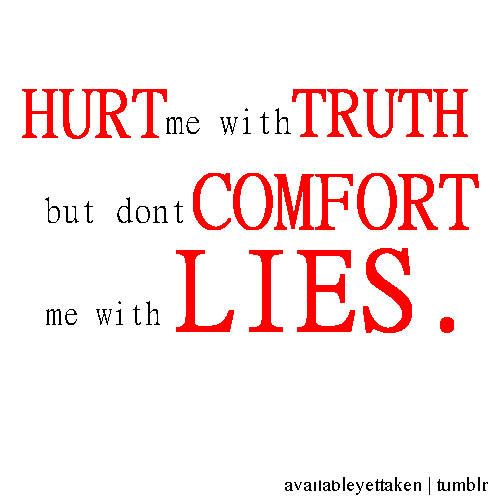 But always say it to the one who is directly concerned with the truth. If you don’t, and choose to speak to a third party, you are actually promoting gossip. That’s when you are vitiating the atmosphere. 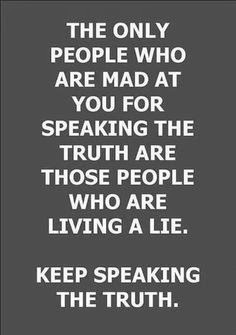 For you, and for the person to whom you intend to speak the truth. Truth does not require any crutches. It can stand on its own. And you too can say it without any fear. But you believe just the opposite is true, in any relationship, because you don’t want to be the person saying it. You prefer that someone else bell the cat. Or that a kid, than you, tell everyone that the emperor is wearing no clothes! That’s fantastic. If you are comfortable being someone who continues to thrive while pleasing everyone around, that’s just fine. Then, why are you grieving? Please don’t. If you are grieving over the state of any of your affairs, and if the people connected with your Life, need to be shaken awake, then throw the truth at them. Let them deal with it than you suffer with it! That’s the way to intelligent living. That’s the way to peace. The whole idea of truth is that there are no versions! Yesterday, I was with a friend who has got caught in a web of circumstances, all of them caused by his congenital tendency to lie. In fact his children called him a compulsive liar and did not want to do have anything to do with him, anymore. As my friend shared the list of choices he had made and the actions he had pursued, it appeared that he had unwittingly spun a web of deceit, some of them circumstantial – getting out of which now called for him to face the harsh realities of Life and which could take a long, very long time. Why is it so difficult to face reality and speak the truth – in any context or situation? People chose to lie because it is convenient. Often times, people are even lying to themselves when they are refusing to see the reality and are in denial. Or they are dressing up the reality to show a different face to the world or themselves. But this is so hypocritical. The idea of truth is that there are no versions. Whatever is, is the truth. Analyzing a situation and arguing in your favour does not change the truth in any way. It only makes you believe that the situation you are imagining and conjuring up is the truth. This is the way that people fool themselves and get into a trap of covering up, lying and running away from the reality, until, as in my friend’s case, they cannot run or hide any more. This is true of all situations in Life – of habits, in relationships, in business and even in the way we think and feel about ourselves and our emotional states. A simple principle to follow is to ask yourself if you are running away from something in Life and if whatever you know, see and feel is the truth. If it indeed is, irrespective of situation or consequence, simply stay with that truth. Life may appear to be complex with the truth but it surely will be peaceful. And when you are at peace with yourself, you can face anyone or any situation in Life! Author AVIS ViswanathanPosted on October 18, 2013 March 14, 2016 Categories Art of Living, Inner Peace, Intelligent Living, Lies, TruthLeave a comment on The whole idea of truth is that there are no versions!